As I mentioned, I’ve been working on coming up with a pattern for socks I can make on my knitting machine without a ribber. Here’s the result! I am glad to see your making good use of the knitting machine! I just purchased a replacement and thought I might try making some socks and came across your blog and spotted your ebay name! Nice pattern directions! Thanks for the pattern. Can’t wait to try — like now!!! I wanted to thank you for your great sock pattern. Do you have any more knitting machine patterns? 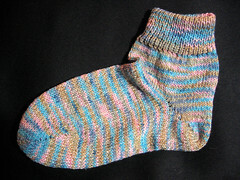 I tried to download this pattern for a sock knitted on a single bed knitter. I emailed you the pattern; let me know if that doesn’t do the trick! I used it to make a gift of silk, marino wool and alpaca socks. Thank you for this pattern! I just got a machine and am looking forward to trying it. This looks like fun. lkm. Thanks so much for the sock pattern! I would like to have the pattern. I am a beginning knitter and hope I can do this.